Celebrating Valentine’s Day in New York? You and your partner are certain to have a romantic time together! Valentine’s Day is the day of love, celebrated annually on the 14th of February. 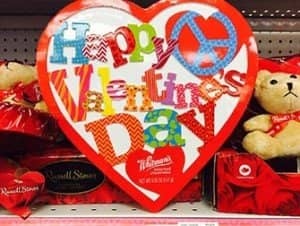 Valentine’s Day is a big thing in the United States, as soon as the New Year begins, you can already spot the first signs of it in some of the stores. New York enthusiastically celebrates this day as well and all the stores and shop windows are decorated. 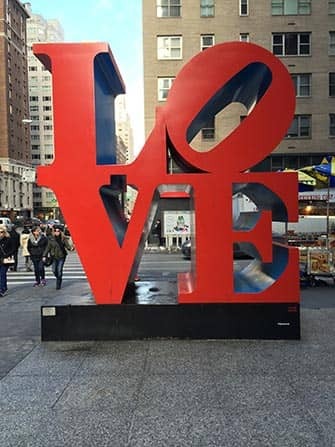 What to do on Valentine’s Day in New York? During the day you can go sightseeing or take a stroll through Central Park: maybe even ask your partner to marry you on the Bethesda Terrace, or on the famous bridge (The Bow Bridge). It can’t get more romantic than that, right? Even in the busiest place in New York, Times Square, Valentine’s Day is celebrated enthusiastically. You can, for example say ‘yes’ again to your love in the middle of Times Square. Also, every year a designer creates a piece of artwork that is dedicated to love. In the evening you can have a wonderful dinner on a Valentine’s Dinner Cruise, sailing along the skyline of Manhattan. Romance is guaranteed on this special boat tour with four course meal. You can also enjoy one of the romantic restaurants in New York. Afterwards you can carry on enjoying the night in a bar or club. To complete your special Valentines stay, you can book a romantic hotel in New York. 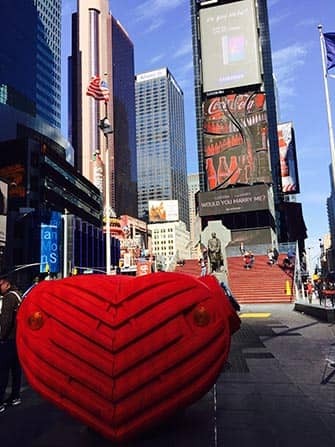 Eric’s Tip: Want to do something extra special and create a memorable Valentine’s Day experience in New York? Buy flowers online and have them delivered to your hotel room! Do order in time and keep in mind that flowers in New York can be expensive. You can buy flowers here.